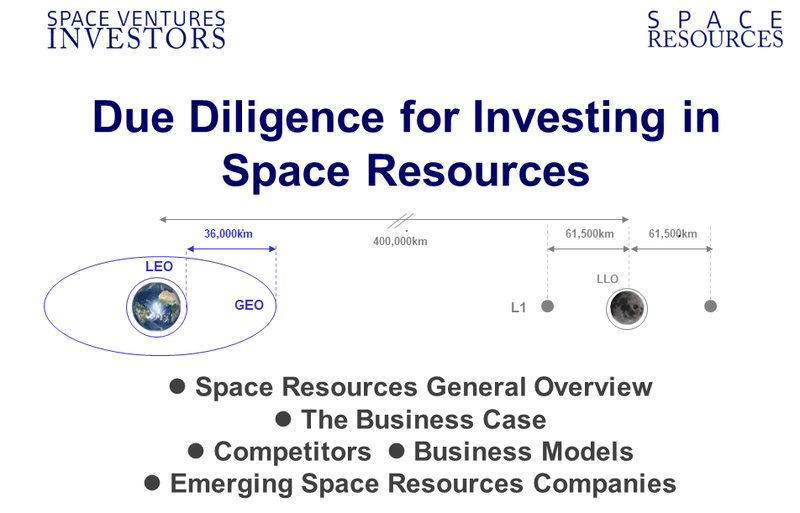 Space Ventures Investors has prepared a Due Diligence for Investing in Space Resources report. The free short version is an overview of investing in space resources, ideal for people and companies conducting preliminary research. It is free but prospective readers must provide their email and name in the form below. The longer version is more complex, and includes an overview of possible companies to invest in, strategies and market opportunities, and is ideal for people and companies conducting pre-investment research, or evaluation of existing investments. If you would like to know more, please get in contact. Please provide a valid email before we email a link to the report. The SCDD is for organisations or firms that need to independently verify if a Space Company (SpaceCo. ), including their product, service, management, staff and business plan, are commercially viable. 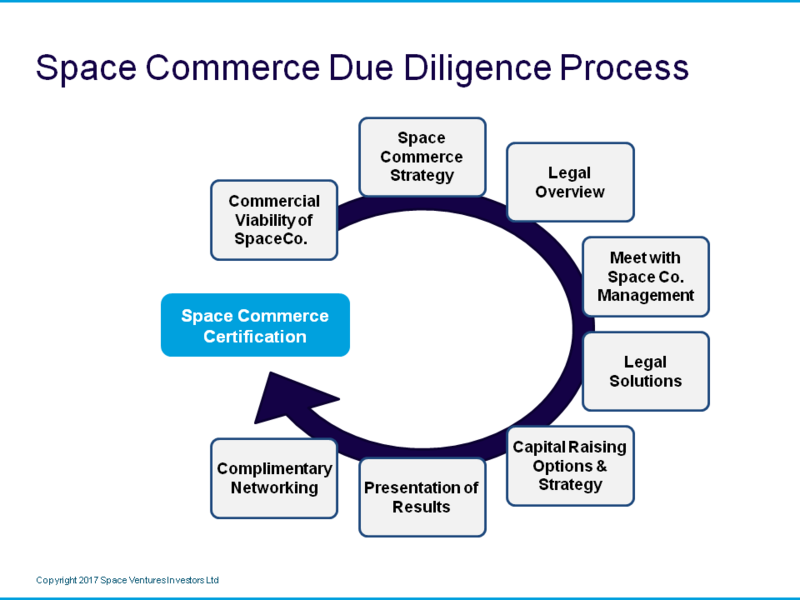 Space Companies undergo the Space Commerce Due Diligence process, and if they are successful, receive Space Commerce Certification: This is a signal to investors and stakeholders that the space company is commercially viable given a certain set of parameters, which are provided by the client / stakeholders and form the framework of the SCDD. The goal is to grade Space Companies (emerging and existing) via a Due Diligence in terms of investment potential, based on their commercial viability and go-to-market ability. The scope of SCDD is non-technical, but technical aspects can be covered by utilising external technical contractors. The SCDD is an initiative from Space Ventures Investors (SVI) and selected partners may evaluate Space Companies on technical aspects, e.g. the viability of space hardened hardware. Space Start-ups: at Seed, Series A, or Series B stage. Space Companies: Raising new funds, seeking new markets, preparing for M&A. Space Ventures Investor�s offers Due Diligence of Space Companies and Space Start-ups, including Missions. Potential Investment Strategy; be it sell-side, buy-side, or a merger. Is the investment a smart move? The Technology: From suppliers right through to launch and operations, who is involved, what's their space history. Where are the weak points? The Team behind the Due Diligence: Space Ventures Investors uses outside specialists to provide an independent point of view that is separate from any of existing or future clients and investments. 1.1 For investors, who are they, what are the sources of their investable capital, and why / would they be appropriate to invest in a related space venture. What is their history of investing in new technology? 1.2 Are there any Conflicts of Interest between investors, target companies, new companies, and their respective management teams, staff, contractors, suppliers, and clients? 2.1 The Viability of the Technology: External contractors may be required to access if planned technology is feasible, including but not limited to is it workable, able to be space tested and certified, and then functional given a certain budget. Consideration is also given to the technology as part of a greater supply chain; is it one (vital) piece in an evolving ecosystem or an extension or amalgamation of existing technology. 2.2 The Viability of the Existing Staff: External contractors may be required to assess if planned space companies, including their particular operations and missions (which may form a cornerstone of their business plan) have the staff onboard (or are in contact with) that can meet their goals, within a certain budget. Highly skilled staff are in demand yet a highly educated and motivated team can be just as effective at reaching their goals. 2.3 The Space Industry and Market Potential: Part of Space Ventures Investors (including operating Space Crowd Fund) business is indentifying investment opportunities in space, which includes earth based systems related to space. From a macro point of view, space start-ups and companies must be evaluated that even though they might have the right technology and staff to pursue a business proposal, would they be able to generate a realistic profit as an ongoing business in the long-term. 2.4 The Growing Market. Another approach is to illustrate the long-term potential of new space start-ups given the growth in the space sector as a whole. An easy example is the hit and miss predictions about the internet made before the internet went mainstream (e.g. browsers became ubiquitous like operating systems). 2.5 Parallel to 1.2, are there any conflicts of Interest between investors, target companies, new companies, and their respective management teams, staff, contractors and clients? As Due Diligence is the business of finding red flags the very action of Due Diligence can raise red and green flags: A company may feel it is being judged or valued and be optimistic or defensive. Therefore it is necessary to where possible maintain a high degree of confidentiality when conducting the due diligence process for clients. All large prospective investors working with Space Ventures Investors are required to partake in some kind of Non-Disclosure Agreement. 3rd Party Launch and Landers Viability. Financing Considerations: Entry and Exit points based on multiple scenarios. Outcome: The business model of �Lunar Co.� is based on a far-out goal and reliant and various 3rd party players (in the diagram, "To Be Developed") reaching their own far-out goals. 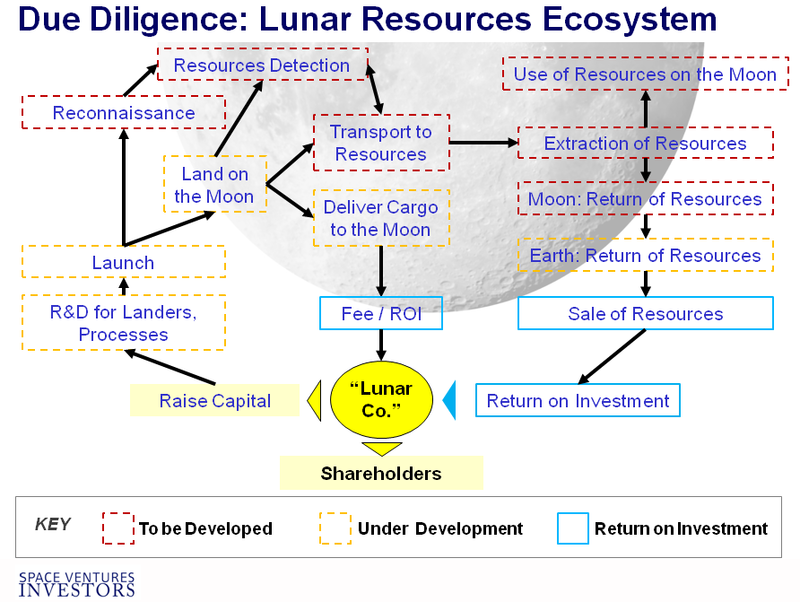 The fragile ecosystem of new technology, new industry (Lunar transportation and some resources) and new space players (who are in various stages of funding, testing, evaluation) means that an investment in Lunar Co. is obviously High Risk with the potential of Very High Profit (Return on Investment), but reliant on numerous other factors. Therefore, for the investor, they could be better off spreading their initial investment between many of the companies planning to operate in that sector (Lunar Operations). In the end the question is, should they hedge with one player, or many of the players in a new sector.